Sunday was an amazing day! I participated in Yoga on the Mall for the first time. I even had the honor of practicing on stage with a few of my favorite teachers like Nina Stanger and Andrew McAuley! Over 1,600 yogis joined in the wonderful event and my goodness was it wonderful! The day started off cool and cloudy but by the time practice started the sun was shining and it had warmed up considerably. If you missed it this year, hopefully you can join me in 2014. One thing is for sure, whether you practice yoga or not, you shouldn’t miss it. Thank you to the organizers of DC Yoga Week for all of their hard work! Sharing the light series: Meet NINA STANGER! Nina’s class was the first Vinyasa Flow class I had ever taken and truthfully it blew my mind. It was a beautiful experience – I was challenged and tired but it felt a lot like poetry in motion. The sequence of poses just made sense. It was where my body naturally wanted to go (aside from Savasana which is where my body ALWAYS wants to go). Her gentle way of teaching has an undercurrent of strength and support guiding you through the practice rather than leading you to it. There is a lightheartedness to her tone and style – you’ll still notice that your body is being taken to its edge – you just won’t mind. Nina is one of my favorite yoga teachers and I am really glad I can share a little bit of her with you. You can find Nina’s classes at extendYoga on Tuesdays at 9:30 AM, Fridays at 5:30 PM and Sundays at 4:00 PM and at Allay Yoga on Tuesdays at Noon. If you’re lucky, you can catch her teaching at Lululemon in Bethesda Row. She is one of their ambassadors. Online you can get to know her on her blog on food addiction and recovery: Prana Rising. When you are ready to take the next step in yoga and you want to learn more about Nina’s teaching style, she is also a core faculty member at the Sky House Yoga – Yoga Teacher Training. 1.How did you find your way to yoga? I think yoga found me, actually. I took my first class in high school as a way to get out of gym class. We had the option to do yoga for a semester, so I chose that since I hated gym. After that, I took random classes at different studios in the area. Then, in college, I again had the option to take it at school for a semester, and the teacher was absolutely wonderful. She was the first Vinyasa teacher I had, and her classes inspired me greatly. I continued to dabble with other classes on and off, but didn’t have a dedicated practice. Then, the summer before my last year of college, I decided I’d really like to be a yoga teacher, but I thought I wasn’t flexible enough, good enough, etc. One of my teacher friends heard me say this, and he said, “If you want to teach yoga, all you have to do is LOVE yoga.” That was all it took; I got over myself and became a diehard Vinyasa student, and a year later, a yoga teacher. FLOW. I guide students through sequences linking breath and body, building flexibility and strength. In my classes the poses are important, but the breath comes first. I like to have fun and teach challenging asanas with gentle spirit. Closing my eyes, taking a deep breath, and remembering that I am alive. Laughing and getting outside helps, too. SLEEP IN. Wake up when my body is ready to wake up, not because an alarm is buzzing! Eat a delicious breakfast (my favorite meal, especially when chocolate chip pancakes are involved), go to a yoga class, hang out with friends/my boyfriend, spend some time in the sun… I’m pretty content as long as yoga and the people I love are involved! Picture yourself in the shadow of the Washington Monument, eyes closed, sitting cross-legged on the grass, palms pressed together in your heart’s center, calmly breathing with hundreds of other yogis. Is it a dream? No way! 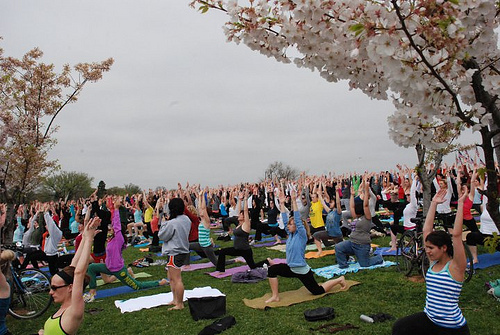 On Sunday, May 15th yogis from all over the area will be descending on the grounds of the National Mall to participate in Yoga on the Mall (YOTM). This event kicks off DC Yoga Week! Their mission is to promote yoga, share the wonderful benefits of a yoga practice, and encourage everyone to give it a try. Participating studios will offer free and $5 classes all week-long! This is your chance to check out your local yoga studio or the one around the corner from your job and find a new place to call your zen home. What? You’ve NEVER tried yoga? Excuse me?! What are you waiting for? Participating studios like Tranquil Space in Washington, DC will open their doors and offer various classes at an unbeatable price. Joining a yoga studio is a huge financial commitment for most of us. DC Yoga Week will allow you to try out different studios with zero obligations. Talk to instructors and seasoned yogis and ask them any questions you may have about yoga then try a beginner’s class or a class on meditation. I have said it before and I will say it again: There are only two types of people in the word – those who can’t live without yoga and those who have never tried it. Participate in Washington, DC’s vibrant yoga community starting with Yoga on the Mall and open yourself up to a whole new way of looking at life. When: May 15 – May 22, 2011 | Mall Event May 15th 1:30 p.m. – 4:30 p.m.